Overall, a nice clean place to stay. Great value. They have a restaurant and bar there. Bar staff not the friendliness but the front desk staff was great. It met my needs! Centrally located in downtown! Would recommend to friends!..... I don’t have anymore to add and yet it won’t just let me submit my review! I was there only one night but everyone I dealt with was very kind and very accommodating. It's a two star hotel...so my expectations weren't very high. MIT was clean, the location was convenient, and the price was good. I appreciated the central location of this facility. The continental breakfast was adequate and its hours until 10 a.m. were good. The bottom of the bathtub in both rooms we had was slippery and felt unsafe---needs new non-skids. Our only real problem was with trying to use the computer to print out boarding passes for our flights. The clerk said that she thought they needed a new router, which makes me think this is not a new problem and should be addressed. This is a substandard hotel at best....use this hotel if and only if there is NO OTHER CHOICE! As we arrived late on friday nite, we could hear the live band playing in the restaraunt/bar attached to the motel, and they sounded very good, but alas we had been up since 4:30 a.m. & it was after 10:30p.m. so we were only looking for our bed. We also noticed the pool,and fitness center, but we never took advantage of them either do to our schedule. Though we have stayed here before and used these amenities and enjoyed them all, this time we were more impressed that our stay was less expensive here than any others. My only complaint is the the air conditioning was very loud, but worked well. It was hard to sleep with it on, and I think it could be updated. Also the restaurant closed at 9:00 p.m. on Friday which seemed a little early, but maybe its not for Danville. Room and staff all were excellent, but the closest Ice machine was up on the 4th or the 6th floors. Yes, we will stay here again. Nice, everything was ready for us when we got there. This hotel seemed shabby and this gave a perception that it wasn't as clean as it could have been. I think it just needs a little renovation to perk it up. 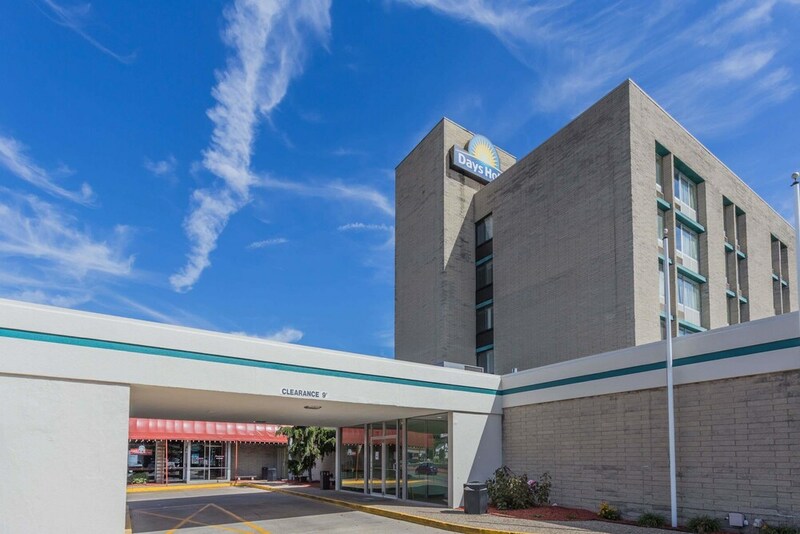 Days Hotel & Conference Center by Wyndham Danville places you within a leisurely stroll of David S. Palmer Arena and Vermilion County War Museum. This hotel has 102 rooms and welcomes guests with conveniences like free breakfast, an outdoor pool, and free in-room WiFi. It's centrally located in Danville, connected to the convention center,1.9 mi (3.1 km) from Harrison Park Golf Course, and also 6 mi (9.7 km) from Heron County Park. Start your day off right with a free continental breakfast, served each morning from 6 AM to 9 AM. This hotel serves as home to a bar, along with a restaurant that specializes in American cuisine. Satisfy your hunger from the comfort of your room with room service. Guests can expect to find free WiFi and 27-inch a TV with cable channels. Beds sport premium bedding and the bathroom offers free toiletries. Other standard amenities include a refrigerator, a microwave, and a coffee maker. At Days Hotel & Conference Center by Wyndham Danville, guests enjoy an outdoor pool, a fitness center, and free WiFi in public areas. If you decide to drive, there's free parking. The 24-hour front desk has staff standing by to help with securing valuables, luggage storage, and dry cleaning/laundry. Other amenities at this family-friendly hotel include conference space, a business center, and an arcade/game room. Hello Guest, Thanks for the stay and the feedback. We shall definitely work on your observations. You can expect a further improved stay next time. Visit us again soon. Sincerely, Hotel Manager. Dear Guest, Thanks for the stay at the Days Hotel & Conference Center and the positive feedback. It is really encouraging. We feel proud when we get such reviews and motivate us to serve better. Look forward to welcome you again. Sincerely, Hotel Manager. After Hours - Restaurant specializing in American cuisine. Open select days for dinner. After Hours - Bar specializing in American cuisine. Open select days. Recreation features at Days Hotel & Conference Center by Wyndham Danville include an outdoor pool and a fitness center.